The Monasterio de los Jerónimos de Santa María de Belém is a Gothic Manueline marvel. The highlight is its three leveled inner cloister. Without doubt, it is the most beautiful cloister that I have ever seen in my life. It's great to get on the top floor and see how the view changes depending on the height. There is also a small gazebo a little higher up which is accessed from the cloister's top floor - it has stunning views. 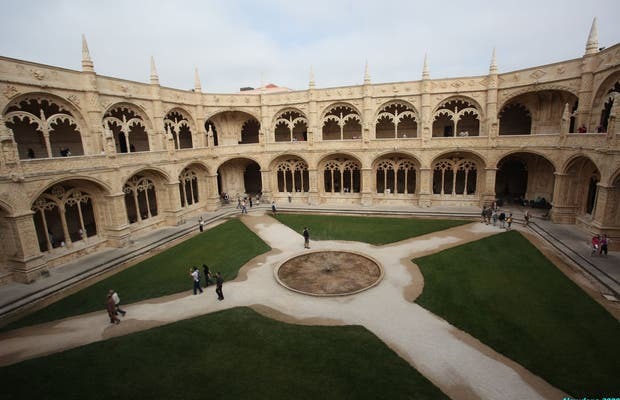 The cloister is the work of Joao de Castlho from 1544. The same artist also has beautiful reliefs in the south porch. Inside, the nave is huge. In Santa Maria church, the vault is supported by startlingly thin octagonal columns. THis is one of the most beautiful examples of the Manueline style of the sixteenth century. It is extensively decorated with Manueline motifs (letter M, armillary sphere, sailors capes, religious themes, niches and medallions). The side aisles of the cloister have ribbed vaults and arches, allowing views of the garden. Inside Gerónimos Monastery is the tomb of Luis de Camões, a sixteenth century poet and the most important writer in Portuguese (the equivalent of Shakespeare or Cervantés in Portuguese literature). A historical-literarycuriosity that people miss. But still a must. A unique example of renaissance building located in Belem. For Pessoa fans, he is buried here!!! You will spend a hole afternoon visiting the cathedral and their gardens, usually crowded, avoid going between 12:00 - 16:00.